It was in March 1975 that I arrived in Vail for a week of skiing with friends who were “ski bumming” there for the winter. On the first day, one of those friends, Herb, and I rode up the Lions Head gondola out of West Vail. Herb was a ski racer who liked going fast and didn’t like stopping. At the top we stepped into our skis and Herb was off. But he only got about fifty feet before slamming the skis to a halt. He kicked off both skis and muttered “Damn cants!” He quickly put the skis on the opposite feet and then accelerated down the trail arcing big GS turns. 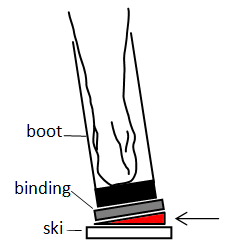 “Canting” is the adjustment to assure that your skis will be flat on the snow when you’re in a neutral stance. That means it will require less effort to get your skis on edge to carve turns. Herb had the kind of cants that were wedges installed between the binding and the ski which made it important to put the skis on the correct feet. The use of cants really caught on in the 1970s and in my opinion that traces back to an article that appeared in the January 1971 issue of SKIING magazine. “If You Can’t Ski Parallel…Cant!” was written by Warren Witherell who was listed as the Director of the Alpine Training Center at Burke Mountain. Witherell made a strong case that any skier trying to make the breakthrough to be an expert should get their stance checked to see if cants were needed. His study had shown that some skiers would never achieve parallel turns without some degree of canting. At the Burke training center they tested every racer and 80% of them required canting. Mike Leach of the Mount Mansfield Ski Club correctly identified Warren Witherell as the author of the article. Mike also commented on last week’s column that Tom Corcoran who founded Waterville Valley was a member of the Mount Mansfield Ski Club when he raced in the 1960 Olympics. Mike is not sure whether Corcoran actually got coaching through the club or just received financial support through the club. Mike says that Sepp Ruschp and C.V. Starr helped fund some of the United States skiers for those Olympics. Ed Gill had a unique way of submitting his answer. Ed sent in pictures of his copy of Warren Witherell’s book, “How the Racers Ski”, opened to the chapter on canting! Witherell was a remarkable athlete who won a world water skiing championship at age 18. At Wesleyan University he played soccer, captained the hockey team, and was an All-American swimmer. After graduation Witherell became an educator who taught English and history. Witherell actually didn’t start alpine skiing until he was 20, but caught on quickly: “My first instinct was to get the ski to work for me rather than pushing it.” Witherell would become a teacher and successful ski coach at the Northwood School in Lake Placid. Eventually Witherell ended up at the Alpine Training Center at Burke which was primarily a weekend race coaching program. However a young Massachusetts fourteen year-old, Martha Coughlin, asked Witherell to be her full-time tutor and coach if she could arrange it with her school. In January 1970 Coughlin arrived at Burke with her bags, her books, and her skis. It was Coughlin who put up a hand-lettered sign on Witherell’s door that said: “Burke Mountain Academy – for hungry ski racers and self-motivated students. Warren Witherell, headmaster and janitor.” Martha Coughlin is still recognized as the co-founder of Burke Mountain Academy. Burke Mountain Academy was the first skiing-specific academy in the United States. In 1972 Witherell would help bring attention to the Academy with his book “How the Racers Ski” which emphasized carved turns and the importance of canting. But his students would eventually bring more attention to the school with their racing successes, successes that continue to the present day! Burke has helped over 135 competitors make their national teams. There have been 33 Olympians total and 5 at the most recent 2014 Olympics including gold-medalist Mikaela Shiffrin! 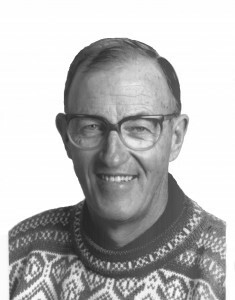 Warren Witherell would leave Burke in 1984, but would continue to add accomplishments: he coached the Rollins College (Florida) water skiing team to a national championship, he wrote another influential book on skiing – “The Athletic Skier”, and he helped lead the Crested Butte ski academy out of financial difficulties. In recognition of his contributions, Witherell was named to the United States Water Skiing Hall of Fame, the United States Skiing Hall of Fame, and is a member of the Vermont Ski and Snowboard Museum Hall of Fame. Warren Witherell passed away in May of 2014 at the age of 79.